This week, with the release of their new synthesis report, [scientists] are trying the words “severe, widespread, and irreversible” to describe the effects of climate change – which for scientists, conservative by nature, falls just short of announcing that climate change will produce a zombie apocalypse plus random beheadings plus Ebola. It’s hard to imagine how they will up the language in time for the next big global confab in Paris. The Guardian’s coverage is – as always – exemplary. In addition to Damian Carrington’s news report, they also give good graph. See also the BBC, and Stuff – who take the AP coverage. 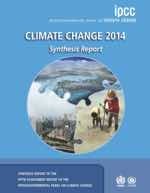 It is the best scientific assessment of climate issues available. I’m delighted that New Zealand scientists have contributed to this body of knowledge.